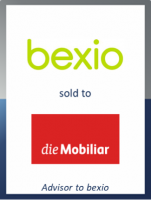 GCA Altium acted as exclusive financial advisor to the shareholders of Bexio, the leading cloud-based business and accounting software solution provider for SMEs in Switzerland, on its sale to Mobiliar, a leading Swiss insurance company. This transaction reinforces GCA Altium's reputation as one of the leading M&A advisors in the software space. Bexio offers cloud-based business software to Swiss small businesses and start-ups. Bexio's cloud software significantly reduces the administrative burden for SMEs, enabling them to concentrate on their core business. It covers the entire administration of an SME – including, for example, creating quotations, automated invoicing and reminders, integrated e-banking, product and warehouse management as well as online accounting with direct trustee access. Bexio, which is based in Rapperswil, Switzerland, and employs over 80 people, has experienced substantial growth over the last years and currently serves over 15’000 customers. Furthermore, in 2016 and 2017, Bexio was named Switzerland's best software start-up.